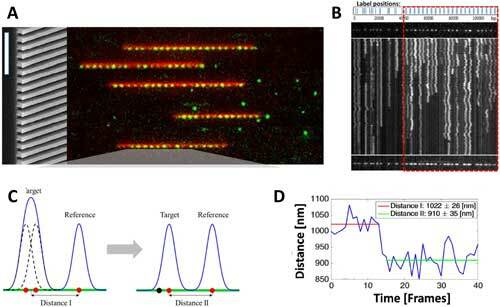 (Nanowerk Spotlight) One reason why people are so excited about nanopore DNA sequencing is that the technology could possibly be used to create 'tricorder'-like devices for detecting pathogens or diagnosing genetic disorders rapidly and on-the-spot. Nanopores function as membrane channels in all living systems, where they serve as sensitive electromechanical devices that regulate electrical potential, ionic flow, and molecular transport through the cell membrane. Scientists are studying nanopore construction with the goal of making man-made cell membranes and single molecule detectors. Biological protein pores used in sequencing have a diameter of about 1-1.5 nm. Sequencing technologies have made it cheaper and faster to read the sequence of bases on a strand of DNA. A promising technology to take these advances further is nanopore sequencing. 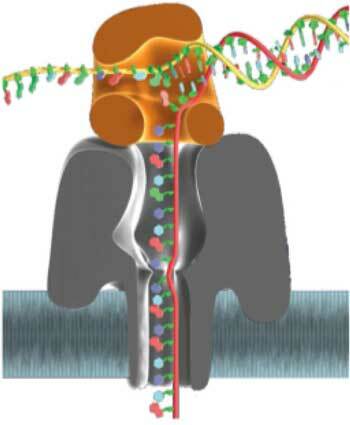 Individual strands of DNA are moved through a nanopore gap not much wider than the DNA itself. As the DNA passes through the nanopore, continuous information is gained about the sequence of individual bases – the A, C, G and Ts that make up DNA (read more in our previous Nanowerk Spotlight: "DNA sequencing reaches new lengths"). Yet, nanopores enable another important way to analyze DNA: genomes can also be mapped. In particular, chromosomal DNA strands are placed inside narrow nanochannels of microscale length to check for genetic rearrangements such as insertions and deletions. Genome mapping aims to identify the location of genes on chromosomes and their relative distance. In a Perspective article by Stefan Howorka at University College London and Zuzanna S. Siwy at University of California, Irvine, also published in ACS Nano ("Nanopores and Nanochannels: From Gene Sequencing to Genome Mapping"), the authors describe the principle, advantages, and challenges of genome mapping with nanochannels and relate it to DNA sequencing. To obtain sequence information with nanopores, individual strands are moved along an internal reading head. The reading head is a narrow and thin molecular constriction of ca. 1.2 nm that is composed of several amino acid residues. When the DNA strand passes by this constriction, bases can be identified by monitoring the ionic current flowing through the channel. One important feature of nanopore sequencing is that it can cover read lengths of up to 200,000 base pairs (bp), compared to a range of up to 1000 bp for existing ensemble sequencing methods. However, as the authors point out, a challenge is that strings of identical bases with different repeat numbers cannot be well discriminated. A novel genome mapping approach highlighted in a recent paper (ACS Nano, "Super-Resolution Genome Mapping in Silicon Nanochannels") analyzes with nanochannels long chromosomal DNA, in the range of a million base pair length. This work makes an important step forward as it tackles the issue of insufficient resolution via a strategy that can achieve a 15-fold improvement. The strategy starts by addressing the main culprit of low resolution, namely, thermal fluctuations of DNA molecules, which is, in turn, a consequence of analyzing DNA strands in solution as opposed to surface-bound DNA. To mitigate thermal fluctuations, the scientists first employed single-fluorophore imaging of labeled DNA. 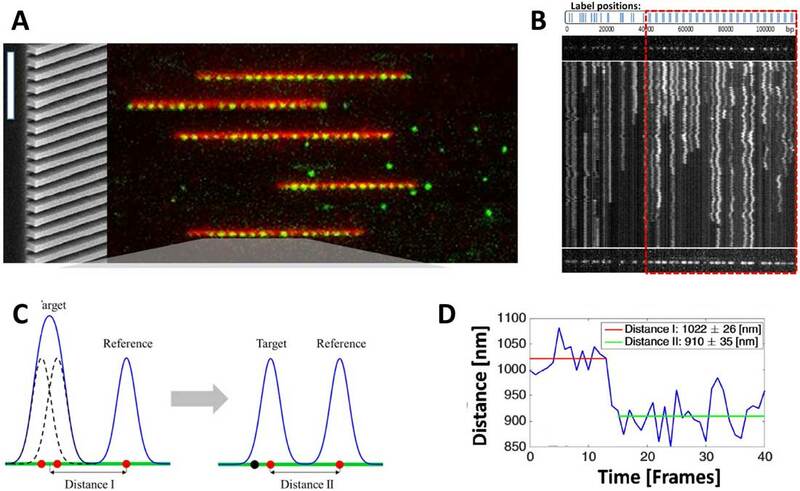 Single-fluorophore imaging is widely used in the life sciences, but in this work it is successfully applied for genomic mapping in nanochannels. By combining the highly photostable fluorophores with less stable, blinking dyes, the multiple fluorophores could be resolved even though the distance between the dyes was smaller than the diffraction limit. "It would be advantageous to simplify the design of the current analysis system to make it fully portable," conclude Siwy and Howorka. "Hand-held sequencing devices enable researchers to perform DNA analyses at remote locations and independent of a centralized facility. Portable DNA sequencing and mapping have great potential to facilitate personalized medicine as well as agriculture and homeland security." Wider adoption of nanopore and nanochannel-based devices would also blur the historic distinction between sequencing and mapping; the very long sequencing reads from nanopores help map larger genomic regions, whereas higher-resolution genomic mapping could provide the sufficiently detailed sequence information that is required for some diagnostic applications. These exciting prospects will undoubtedly fuel more research into the fundamental science and applications of nanopore- and nanochannel-based DNA analysis.